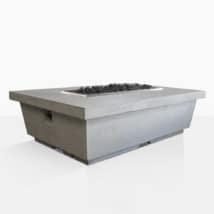 We are excited to introduce our incredible line of modern and sophisticated concrete outdoor fire pits. It’s time to put your feet up and enjoy your outdoor living space throughout the changing seasons with the help of these amazing pieces. We offer 3 different sizes; rectangular, square and round. 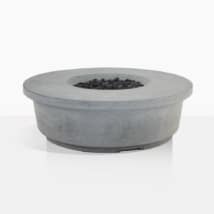 These gorgeous fire pits can be hooked up to your own gas or with an attachment for a propane tank. What’s even better is that we designed a storage container that will cover the ugly propane tank. 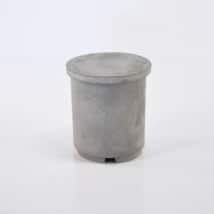 We created it to look like, and function like one of our stunning concrete side tables. We use a high-quality concrete and resin mix to make our concrete outdoor furniture and accessories. The raw concrete exterior has a versatile style that allows it to be used in many outdoor spaces whether modern, industrial, chic or rustic. 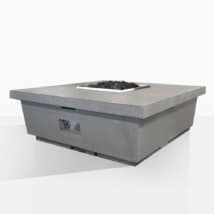 The mechanics and inner workings of the fire pits are extremely well built and easy to use. Complement your Fire Pit by surrounding it with one of our regal A-Grade Teak Sectional Sofas. Deep seating pieces and the sharp lines of the fire pits make for a stunning and contemporary look. Or add multiple relaxing chairs and accent tables for a warm and inviting vibe around the Round Concrete Fire Pit. Either way, these classy fire pits will make your sure space is luxurious and comfortable for all of your guests.